Somites are cellular masses originating from paraxial mesoderm on both sides of neural tube during embryogenesis. 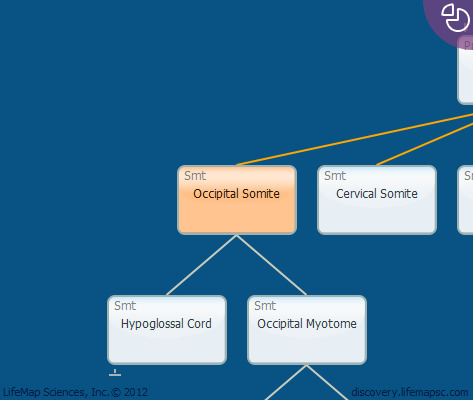 The process of somite formation is one of the defining characteristics of vertebrate development. This process occurs in an anterior-to-posterior direction and in a bilateral, symmetrical manner to provide the formation of the symmetric musculature and bones of the adult body. Somites first appear on day 20 of gestation in humans, at the head-neck border and continue to form at a rate of 3-4 somite every day. In all verterbrates, the somite formation begins at the anterior embryo immediately caudal to the otic vesicle. Occipital somites (1-5 in human) fuse at an early stage of embryonic development and do not contribute to segmented skeletal structures. They incorporate into the occipital area of embryonic skull, give rise to the tongue muscles and also condense to contribute to the basi-occipital and exo-occipital cartilages.